Wine and Investing 101 attracts young people who lack much financial literacy. They're here for Wine and Investing 101. 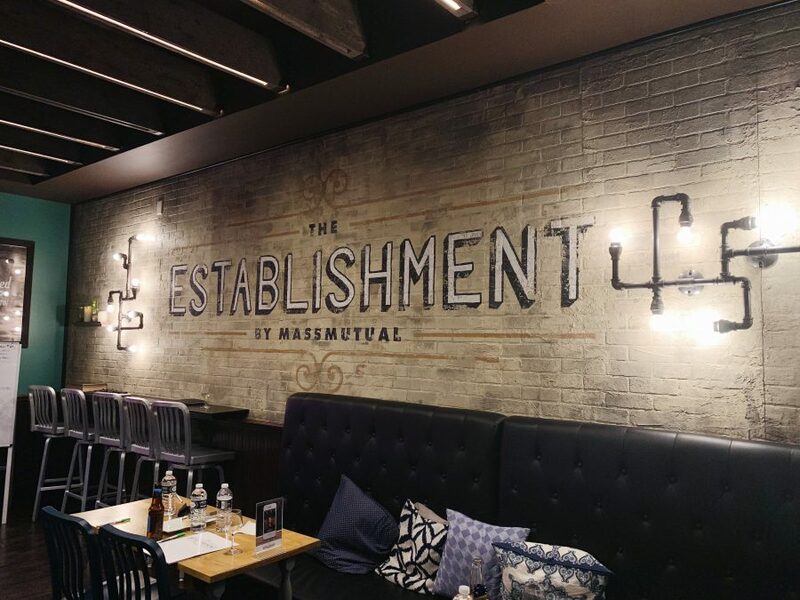 It's one of around 15 free financial crash courses taught by MassMutual's school, The Establishment, created with the specific goal of teaching Millennials about finances. Shortly before class starts, students seat themselves in a boardroom that’s been made to feel like an intimate wine bar. Industrial pipe lighting, like the kind you might see at a new brewery, illuminates the space and pillows cushion black, leather booths. Rich charcuterie boards filled with fancy cheese -- Millennials "killed" American cheese -- are spread out on wooden tabletops, along with white folders filled with digestible financial hand-outs for each student. If you've seen any Millennial-related memes on the internet over the past couple years, you'll know that the generation famously likes their avocado toast, but not necessarily saving for retirement. While The Establishment certainly isn't the only place offering financial literacy courses for adults -- Jericho Road Community Health Center and Belmont Housing Resources for WNY are two others -- it markets the classes in a way Millennials respond to. Hence the wine, truffle pizza (avocados would be too on-the-nose, don't you think?) and financial Pinterest quotes on the walls, saying things like “Taking [the] bull by the horns" in swirly fonts. This class, which is taught every month, has the added appeal of wine tasting; students would soon learn that a cabernet sauvignon helps the diversified portfolio lecture go down much smoother. Ray Pavicich, a financial adviser and the class's teacher, explains basic investing in intervals, with a wine expert named Dan filling in the breaks with tastings and lessons on wine quality. (Did you know that when white wine ages, it takes on color, but as red wine ages, it loses color?) This is their most popular class, presumably because, well, wine. But it's not the only one with alcohol, there's also a Crafting Cocktails and Financial Plans class. One of the night's students is Rachel Adel, a Tonawanda resident and recent SUNY Geneseo graduate, who just started a new teaching job. She's at the class with her friend to learn about the investment plans offered by her school, the purpose of investing and how to do so responsibly. “What would you say, if you were to gauge your level at financial…” I asked Adel. Students took their seats and dove into prosciutto, prepared to listen to Pavicich explain 401(k)s, diversified portfolios and stocks, which they likely never had the chance to do in high school, with intermittent wine tasting breaks, which they definitely didn't have the chance to do in high school. The Establishment teaches Millennials about all of the financial skills they probably never learned in high school. MassMutual began hosting financial literacy classes, with a spin, in 2015. And at the same time, studies surfaced about Millennials and their saving habits, which looked grim. Studies showed that more than half of Millennials had less than $1,000 in the bank. More studies analyzed why Millennials weren’t saving. The Atlantic reported that Millennials don’t trust banks after the 2008 recession. That's the same idea with The Establishment's financial classes. You could go your whole life ignoring what Roth IRA means, but that doesn't mean you necessarily should. And why not do so in a setting made to feel like one you'd visit by choice for a happy hour? “The idea is that the delivery of this type of education and seminars in the past has been very stuffy," said Pavicich, the evening's teacher. "The people presenting seemed unapproachable, so we just wanted to have an ambiance that was inviting and fun and relaxing." High school students take physics and global history, but often express frustration that they don't know anything about credit scores or the student loans they're about to take out for college. Most high schools don’t require any sort of financial literacy class, The New York Times reported in January. The Times reported that only five states -- and New York is not one of them -- have a requirement that students must take at least some sort of “personal finance course” for half a year before graduating. Bills are currently in the works in some states, including Florida and Arizona, to mandate financial literacy in schools. Across the country, personal finance courses are required of only 16.4 percent of high school students, Business Insider reports. Isabella Kaplan, a student in this evening's class, lives in Clarence and teaches financial literacy at Catholic Charities to students working on their high school proficiency exam. She's here to learn more about investing to relay back to her students. In her financial literacy class, she covers skills she wished she learned in school. "Like how to budget, how to save, even how to use an ATM, because I know the first time I used an ATM, I had no idea what to do," Kaplan said. “In addition to food and drinks, we do actually have a financial presentation,” Pavicich jokes to begin class. He clicks through PowerPoint slides, explaining that the class came out of a realization that Millennials approach finances differently than previous generations. They buy things differently, research on their own and interact in different ways with the financial world. Pavicich defines stocks and bonds for us, as promised on the website, but also explains why a diversified portfolio gives you a less bumpy ride and less return. He describes, in layman's terms, inflation, risk tolerance, liquidity, Roth IRAs, the difference between qualified and non-qualified investments. I'd tell you what they are, but I think I might need another class first. He dispels myths. No, the stock market isn't actually like "The Wolf of Wall Street." “Lots of people think you need to be rolling in dough for it to make sense to invest," Pavicich said. “There is always a reason to not do it that day." As class ended -- no exams, no homework -- I asked Adel and Kaplan what they learned. “He said that we will leave with more questions and I think that’s 100 percent true. I still don’t feel 100 percent confident on investing," Adel said. "I think it was a good basics course, but if they have courses with more information, I think that would be good to follow up with." On each table, flyers of a young woman taking a selfie read “Go ahead, snap away.” I catch a glimpse of one woman trying to take a photo of the class on her phone. Not many financial literacy classes encourage selfies. Then again, this class is different. It has wine. Out of about 15 total classes, 10 are offered monthly. For a full list of classes and dates, visit the website.